I'm trying to discover why three out of three of my selected hard-disk recorders refuse to work on my Debian Etch (Demudi) system. Once again I ask myself the relevant questions: Is it me ? Is my computer trying to tell me something ? Is it something I said ? Whatever the reason(s), my reviews of those three programs must remain in limbo until I figure out what's wrong. The applications are all known to run perfectly well on other machines, so I'm sure there's an external problem. When testing new applications one must be prepared with the newest dependencies. CVS sources are often required. Sometimes one must mutter obscure invocations. Alas, I was not sufficiently prepared. Time for a radical shift. In this entry I'm going to introduce two audio-optimized Linux distributions, Apodio and Dynebolic. Both systems can be run in "live" mode, i.e. you put the distribution disc in your CD drive, you reboot, and voila, you're booted into the system. Basically the live mode runs itself from a RAM disk and the distribution CD. The process is transparent, except for the occasional disc reads. The systems can be installed to a hard-drive, but to keep things simple for myself I've tested them only in live mode. The designers of Apodio and Dynebolic share an agenda, a plan to put high-quality tools for multimedia creation into the hands of artists all over the world, and they want to make these tools freely available. As a side-effect of this definite agenda these systems have relatively low hardware requirements. Believe me, the software side is high-grade, but the designers have considered that not everyone has access to high-powered hardware. 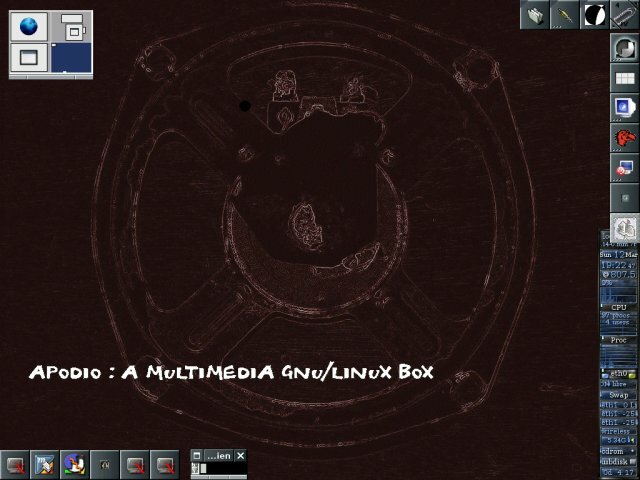 Apodio 4.3.9 is based on the Mandriva 2006.1 distribution, with a 2.6.12 kernel, ALSA 1.0.9b, and version 0.100.1 of the JACK audio server. I was unable to determine whether the kernel had been optimized for low-latency audio and high-definition MIDI timing, but Apodio's overall performance was impressive. My machine has an 800 MHz Duron CPU, plenty of memory, and no problems meeting the remaining requirements. When the Apodio disc takes benevolent control of your computer it presents you with a list of boot options. These options are primarily for language and keyboard layout selection, but the list also includes media check and safeboot options. A nice touch. Further into the boot process you can also select your preferred video resolution. Apodio recognized all my hardware, including my SBLive and M-Audio sound devices (and in that order). Drivers were auto-installed, and when the Apodio desktop appeared the system was ready for immediate use. Well, almost immediate: First I had to configure JACK, but that was easily accomplished via QJackCtl. I wanted to push the JACK system a bit, so I configured it for sub-12 milliseconds latency. My installed Demudi system won't run safely in that configuration, but Apodio seemed to have no troubles in performance. Some xruns were reported when opening or closing some applications, but none occurred while running them. Impressive. The only hardware problem I encountered was a show-stopper for networking. I simply could not connect to my cable connection. The right driver is installed, the system correctly identifies the hardware, but drakconnect just doesn't make the connection. I should mention that I have yet to research the problem, hopefully a fix is already available. 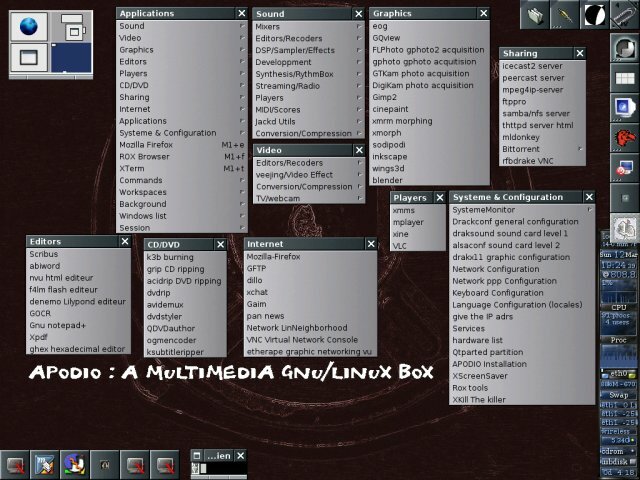 The selected audio/MIDI applications include most of the high profile Linux sound and music projects. Ardour is here, along with ecasound, Rosegarden, and MusE. JAMin, Hydrogen, ZynAddSubFX, Jack Rack, BEAST, they're all here. Pd is here, but I wondered why Csound5 is not. Common Music is missing, along with the other members of the CCRMA family of sound and music software. These are all powerful environments with relatively low minimum requirements, perhaps they might be included in a future release ? After configuring QJackCtl I started the Hydrogen rhythm programmer. I loaded one of the demo songs, clicked on the Play transport button, and behold, there was sound. So I fired up the Jack Rack, loaded a bunch of LADSPA effects, made my connections in QJackCtl, and jammed with my guitar along with Hydrogen's drums. Later I played with the ultra-suave ecamegapedal. No xruns in performance, not one. I wanted to record my random improvisations into Ardour, but it failed to open, leaving an error message about an illegal instruction. Uh-oh, I'll bet that my Duron is missing support for a Pentium instruction that's been built into the Ardour binary. Oh well, leave it and move on. Let's try Rosegarden. Rosegarden worked fine, but its interface seemed to have a cultural identity crisis. The mixture of languages throughout the program was comprehensible if you could read enough French and English. I did all right with it, but there does seem to be a problem in the internationalization for Rosegarden. Otherwise the program ran with no problems. I loaded various files into it, standard MIDI files and Rosegarden projects, and I recorded some audio test tracks. No problems at all. Rosegarden is a solid sender, it definitely took the sting out of losing Ardour. The Audacity and ReZound soundfile editors are included. I also checked out the packaged version of mhWaveedit. I haven't looked at this editor for a long while, but its users have continually reported happiness, particularly with its stable JACK support. As I discovered, mhWaveedit is indeed a very cool program, but you'll have to wait until I write another Linux soundfile editors round-up to learn more about it. Just be sure to check it out yourself when you try Apodio. I encountered only one other notable problem. The main screen pop-up menu includes an option to switch from the default WindowMaker to the Blackbox window manager. WindowMaker is very nice, but I'm experienced with Blackbox. Alas, clicking on the menu item did nothing. Again, it's not a big deal, WindowMaker is cool (see the Figures), but I would like to use Apodio with Blackbox. Apodio's selection of video applications includes Cinelerra, Kino, and surprisingly Jahshaka. The system also provides a variety of programs and utilities for streaming and sharing media. Alas, time and space forbid delving into this cornucopia. Fortunately you can delve into Apodio for yourself any time. Just download the latest ISO image, burn to disc, reboot, enjoy. Denis Rojo, aka jaromil, has designed Dynebolic to meet "... the needs of media activists, artists and creatives as a practical tool for multimedia production". With this goal in mind Dynebolic has been designed to be functional and powerful even on lower-powered hardware. According to its minimum requirements Dynebolic will run on any machine with at least a Pentium processor and 64MB RAM. Since Dynebolic runs in either live or installed modes you don't even need a hard disk. Oh, and if you have an Xbox you can even run Dynebolic on that hardware. Dynebolic has an interesting technical history, you can read about it in this entry on Dynebolic in Wikipedia. I won't repeat that material here, you should read it yourself, but I will note that it states that Dynebolic's 2.6.17 kernel has been modified for low-latency multimedia performance. Dynebolic's boot options include ACPI control, a special kernel image for debugging the system, and of course the expected choices for screen resolution. The system recognized all my hardware without complaint, even installing the drivers for my soundcards in my preferred order (Delta 66 as Card 0, SBLive as Card 1). Alas, I had no luck with my networking hardware. As with Apodio, the system recognizes the Ethernet card and installs the correct driver. The networking configuration dialog reports no difficulties, but I just can't make a connection. Is there something I'm missing with regards to using a Tulip Ethernet driver, a cable modem, a Linksys router, and Linux ? Even my Demudi system can't make the connection automatically, I invariably have to call pump -i eth0 to get hooked up to the Internet. Unfortunately the pump binary isn't included with Dynebolic (or Apodio) and I haven't yet discovered what other utility will do the same job. No fear, I don't need the networking right away, so let's move on to check out Dynebolic's selected soundapps. WindowMaker is again the default window manager, but I could switch to Fluxbox with a single mouse click. Fluxbox is my current window manager of choice in Demudi, so I opted to work with it in Dynebolic too. Applications are accessed via the main display's pop-up menu, and the relevant categories include software for creating, editing, and playing video and audio content. Streaming media support comes from MuSE, a powerful application for audio mixing, encoding, and Internet broadcasting, written by Dynebolic's own jaromil. Dynebolic's sound system is based on ALSA 1.0.11rc4 and JACK 0.100.0. The settings in QJackCtl are conservative but immediately usable. I reset the system to the same values as used in my tests of Apodio, with the same excellent results. One point of strangeness: I could not find the Envy24ctl mixer for my Delta 66, but fortunately the humble alsamixer utility worked perfectly to set the I/O channel volume levels for my card. 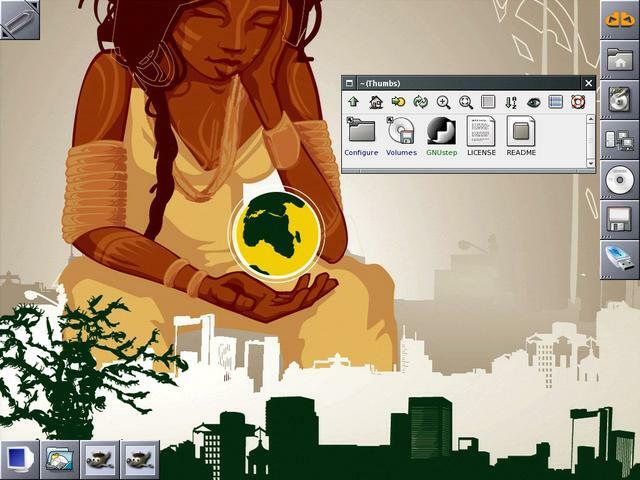 The applications menus show off a variety of multimedia programs and tools. The selection has been judicious, jaromil didn't just stuff everything he could find into his distro, and the included apps are all well-tested popular programs. If there's something missing you need only advise jaromil, or if you're the ambitious type you can just build it yourself. I ran exactly the same tests as I ran for testing Apodio, with similar results. I experienced joy in my rambling improvisations with Jack Rack and Hydrogen, I recorded tracks of magnificence in Rosegarden, and I watched Ardour fail with the same reference to an illegal instruction. A note to packagers: Watch out for those pesky SSE instructions when compiling Ardour binary for use with an AMD Duron, they don't work on that CPU. The great thing about live systems is that you just can't lose. Don't like the the system ? Reboot, try another one, repeat as neeed. However, I don't know how you can't like Dynebolic. It's engineered well, presented nicely, includes a good choice of applications, and it runs fast and smooth. Try it yourself, the cost is negligible (US$0.00) and you can keep your existing system pristine and untouched. Like I said, you can't lose. By the way, if you don't already know, you can find links for all the software mentioned in this article at linux-sound.org. Many have colorful logos. Next time maybe we'll look at some more live disc distros. Maybe I'll have those hard-disk recorders working here, and maybe I'll decide to write about something else entirely. You'll have to tune in to find out. Meanwhile, download Apodio and Dynebolic, have some creative fun and make some joyful noise.